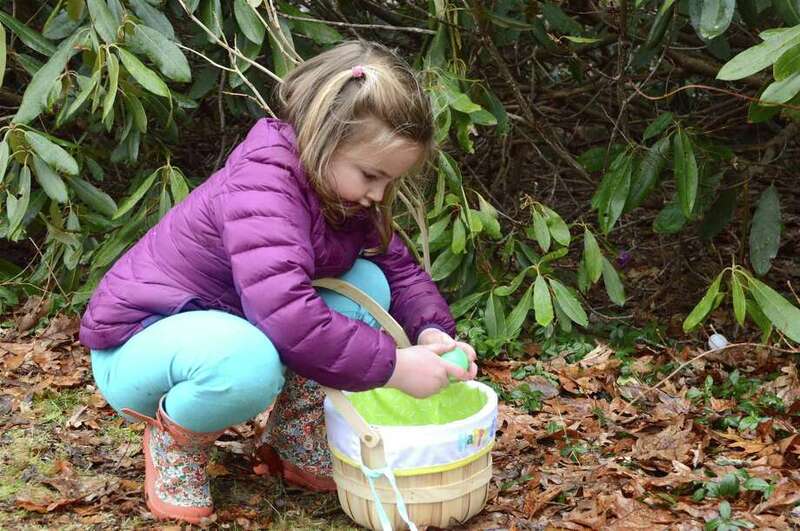 Ainsley Taliercio, 5, of New Canaan, takes a closer look at a find at the annual egg hunt at the New Canaan Nature Center, Thursday, March 29, 2018, in New Canaan, Conn.
NEW CANAAN — The Easter Bunny really hid the eggs well this year at the New Canaan Nature Center, but fortunately a bevy of kids came by to search them out and collect them. Thursday, Friday and Saturday the center hosted its annual egg hunt, organizing small groups of up to 25 kids at time, insuring better chances at collecting. “That way everyone is guaranteed a good time,” said Michelle Hips, director of community engagement. Kids also had a chance to see the new baby chicks that were born at the center, and learn a bit about the long-term responsibility of caring for animals they might choose to adopt. “I like watching the kids run around to find the eggs,” said Derick Hips, animal care manager, noting the older kids had to search harder in a wooded area to find theirs.